This mini-conference (hereafter, WOLLAPA-2-ZA!) 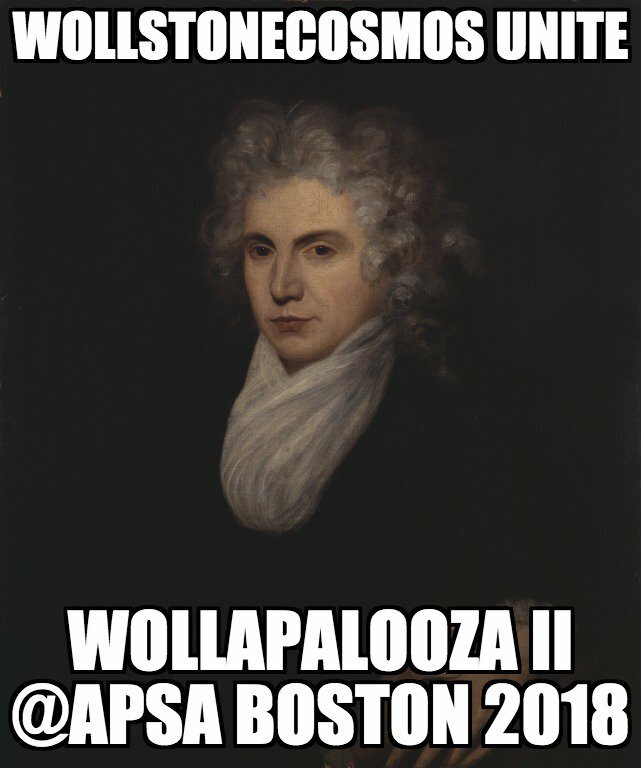 to be held at APSA 2018 in Boston showcases further work in preparation for The Wollstonecraftian Mind, the first comprehensive philosophical compendium on Wollstonecraft and her legacies, and also directly engages the themes of the broader conference--democracy and its discontents--from various historical, feminist, republican, intersectional, and critical race perspectives. WOLLAPA-2-ZA! also celebrates two major bicentennials for feminist political theory in 2018: Mary Shelley’s Frankenstein (London, 1818) and Hannah Mather Crocker’s Observations on the Real Rights of Women (Boston, 1818) The work of these intellectual daughters of Wollstonecraft provide a frame for thinking about how Wollstonecraft’s work as a writer, mother, philosopher, and advocate of women’s and other human rights has shaped discourses and practices of dissent among discontented creatures of modern democracy, including women, slaves, racial, ethnic, gender, and religious minorities, the disabled, and children. Format: Presenters speak for 15 minutes each, followed by discussion with audience adjudicated by chair. Format: Authors present papers (12 minutes) followed by comments from discussant (8 minutes). Chair adjudicates discussion with audience for remaining time. Format: This session format incorporates a handful of topic clusters engaging the comparative study of feminist republicanisms, past and present, each staffed with a scholar in the field who has successfully used new methods and epistemological frameworks to engage the justification and import of feminist approaches to republican politics. Attendees group together at tables to discuss research processes, methodologies, ask questions, and brainstorm together around issues in this growing field in the history of political thought, feminist theory, and political theory more broadly. Format: Each discussant presents analysis of paper (12 minutes) followed by response by author (8 minutes). In remaining time, the chair adjudicates discussion with the audience. Jack Turner (University of Washington), "Empire and Equal Opportunity: Audre Lorde on the U.S. Invasion of Grenada."